We determined earthquake locations through re-picking of P- and S-wave arrival times recorded by BMKG network. Earthquake locations were determined using Hypoellipse code that employs a single event determination method. We then relocated the events using hypocenter double-difference method. We also conducted focal mechanism analysis to estimate the type of fault slip. The results indicate improved hypocenter locations, where patterns of seismicity in West Java were delineated clearly. There are several clusters of earthquakes at depths ≤ 30 km, which are probably related to the Cimandiri, Lembang, and Baribis faults. In addition, there is another cluster in Garut trending southwest-northeast, which is possibly related to a local fault. Histograms of travel-time residuals depict good results, in which travel-time residuals are mostly close to zero. Source mechanism throughout the Lembang fault indicates a left-lateral strike slip in agreement with previous studies. The Cimandiri fault also shows a left-lateral slip, but in the south it shows a thrust fault mechanism. While the source mechanisms of the western part of the Baribis fault indicate a thrust fault and the cluster of events in Garut shows a right-lateral slip if they are related to a local fault. West Java has a complex tectonic structure as this region is affected by the Java subduction zone and faults. The subducted Indo-Australian plate beneath the Eurasian plate along Java Island has produced some active faults in West Java, i.e., Cimandiri, Lembang, and Baribis faults and some volcanoes, i.e., Mt. Salak and Mt. Gede-Pangrango in Bogor, Mt. Tangkubanparahu in Bandung, Mt. Guntur and Mt. Papandayan in Garut, Mt. Galunggung in Tasikmalaya, and Mt. Ciremai in Kuningan. Therefore, the western part of Java has high seismic activity (Damanik et al. 2012; Sakti et al. 2012). Based on the historical earthquake data, large earthquakes occurred in West Java, e.g., in 1780 and 1834. They are crustal, destructive earthquakes with estimated magnitudes of 8.5 and 7.0–7.7, respectively (Albini et al. 2014; Nguyen et al. 2015; Harris and Major 2016). The Lembang fault was identified as a left-lateral strike-slip fault with an overall length of 29 km (Afnimar and Rasmid 2015; Daryono 2016). The Cimandiri active fault zone consists of six segments with a predominant sense of reverse motion (Marliyani et al. 2016). Based on CSAMT data it is shown that the Lembang and Cimandiri faults are not connected to each other (Sanny 2017). These faults are of high potential hazards, because they are located close to densely populated areas. Based on the Central Bureau of Statistics of Indonesia (BPS) data in 2013, the population of West Java was 46,183,642. Most of them live close to the faults. High seismicity due to tectonic activity gives a lot of information to study the subsurface structure. Hypocenter determination and accurate focal mechanism analysis are needed to advance our study about characteristics (nature) of the active faults in West Java. The aim of this study is to identify relations between distribution of faults in West Java and seismicity through accurate earthquake determination and hypocenter relocation, and focal mechanism analysis. The results of this study can be used as input for updating earthquake hazard maps in West Java. In this study, we picked carefully, P- and S-wave arrival times of 3-component waveform using Seisgram2K (Lomax and Michelini 2009), see an example in Fig. 1. The data were recorded by the BMKG seismic stations from May 2009 to December 2015 in the western part of Java and its surrounding areas. There were 168 events that have been determined using Hypoellipse code (Lahr 1979). The method was previously applied to determine earthquakes, e.g., beneath the Merapi volcano in central Java (Ramdhan et al. 2017), in Madiun, East Java (Nugraha et al. 2016), and in West Java (Supendi and Nugraha 2016; Supendi et al. 2018a). We used HypoDD program (Waldhauser 2001) to run the double-difference method (Waldhauser and Ellsworth 2000) for relocating hypocenters determined in this study. The method assumes that if there are two earthquakes with hypocenter distance smaller than the distance of the hypocenter to the recording station, ray paths from these earthquakes are considered to propagate through a similar medium. HypoDD minimizes residuals between observed and calculated travel-time differences in an iterative procedure, and after each iteration, the locations and partial derivatives are updated. This method has been successfully used to relocate earthquakes in Indonesia using the BMKG data, for example in Sumatra (Ramdhan and Nugraha 2013; Supendi et al. 2017; Nugraha et al. 2018), East Java (Cahyaningrum et al. 2015), Sulawesi (Ismullah et al. 2017; Supendi etal. 2018b), Molucca (Utama et al. 2015; Nugraha et al. 2018), and Papua (Sabtaji and Nugraha 2015). The relocated events facilitate tectonic interpretations in detail. For selected events in our study area, we used the ISOLA package (Sokos and Zahradnik 2008) to perform moment tensor inversions from at least three BMKG seismic stations (see inverted blue triangles in Fig. 2). Stations at a small epicentral distance were selected. The observed waveforms were pre-processed using a high-pass filter with a corner frequency of 0.07 Hz to 0.15 Hz. For hypocenter determination, relocation, and focal mechanism we used the seismic velocity model resulting from a previous study, i.e., Koulakov et al. (2007). 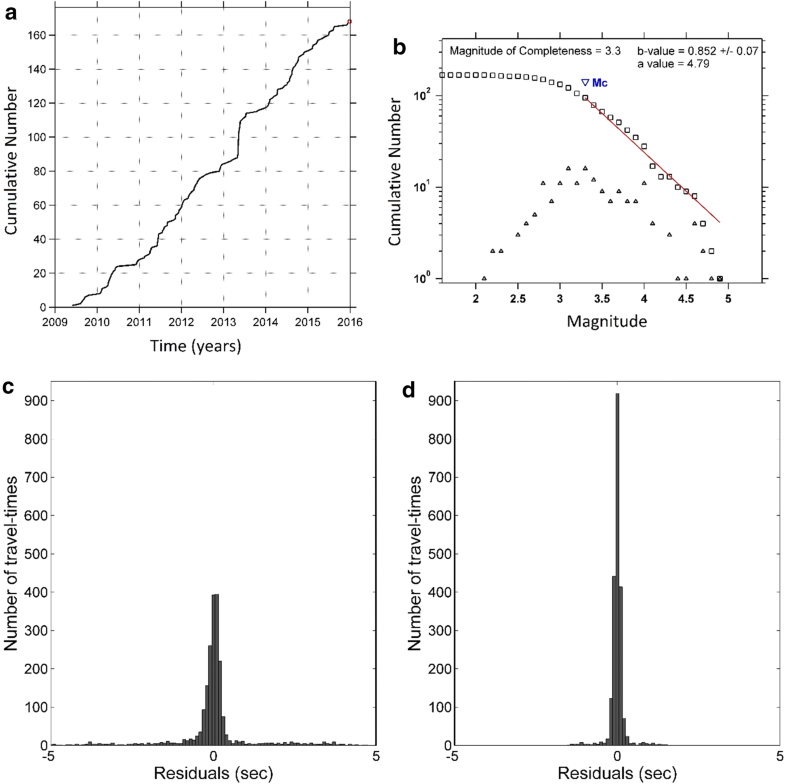 We have successfully located 168 shallow earthquakes (depths less than 30 km) recorded from 2009 to 2015 with high accuracy in the mainland of West Java (Fig. 2). Figure 2a depicts some earthquakes that are located away from the faults. To figure out earthquake detection capability of the BMKG seismic station network in West Java, we have plotted earthquake cumulative number (Fig. 3a) and the frequency–magnitude relationship (Gutenberg–Richter law) using the data from initial location with the maximum likelihood method provided in the Zmap package (Wiemer 2001). The results show that Magnitude of Completeness (Mc) is relatively good for regional networks with 3.3, while the b- and a-values are 0.85 and 4.79, respectively (Fig. 3b). Here, therefore, we relocated events using the double-difference method to obtain more precise positions of the hypocenters. The arrival-time catalog data of each event were processed using Ph2dt program in HypoDD packages (Waldhauser 2001). The Ph2dt program seeks for the catalog data of P-and S-wave arrival times to paired events with the same travel time. The parameters used in this study consist of 30 km maximum hypocentral separation (MAXEP), 50 km maximum number of neighbors per event (MAXNGH), and the minimum number of links required to define a neighbour (MINLNK) is 8 phases. We have successfully relocated 117 out of 168 events along the mainland of West Java, while 51 events excluded by the HypoDD were not eligible to be carried out in the relocation process. We compare the relocated events with their initial locations in Fig. 2 and show the histograms of residual times for before and after relocation in Fig. 3c, d. The histogram in Fig. 3b depicts good relocation results, in which the residual times are centered close to zero. Vertical cross-sections of relocated hypocenters shown in Fig. 4 depict hypocenter distributions along the Lembang and, Cimandiri faults, and Garut to the south of Bandung. In the time period of 2009–2015, there were three destructive earthquakes in West Java (see Fig. 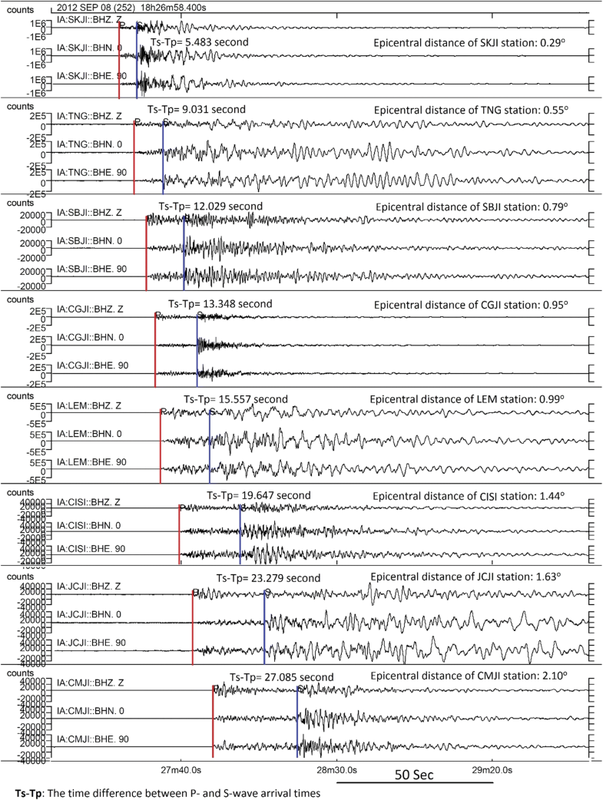 2b) occurring on 28 August 2011 (ML 3.3), 8 September 2012 (ML 4.6), and 18 December 2013 (ML 4.3). Based on the National Disaster Management Authority of Indonesia (BNPB), the event on 28 August 2011 (ML 3.3) caused some damages: 5 houses heavily damaged, 25 houses moderately damaged, and 73 houses lightly damaged in the district of West Bandung. The event is probably due to the activity of the Lembang fault. The destructive earthquake on 8 September 2012 (M4.6) and 18 December 2013 (ML 4.3) were located in Bogor and Sukabumi regions, respectively. The event of 2012 caused some damages to 567 houses and public facilities. 68 public facilities were heavily damaged, 85 moderately damaged, and 414 lightly damaged in the Bogor region. While the event in 2013 caused 2 houses heavily damaged, 18 houses moderately damaged, and 326 lightly damaged in the Sukabumi region. We also plot the destructive earthquakes in West Java before 2009 from previous studies (Supartoyo 2008; Musson 2012) as shown in Fig. 5. We have also derived focal mechanisms through moment tensor inversions for 39 selected events to estimate the type of fault slip (see Fig. 6a) around the Lembang fault (event number 1–4), the Cimandiri fault (event number 5–15), the Baribis fault (event number 24–31), and the Garut cluster (event number 16–23). 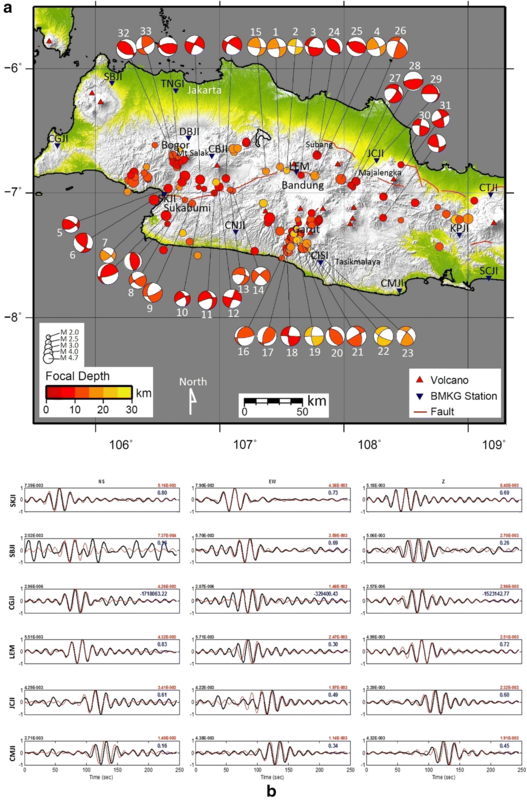 The new seismic hazard maps of Indonesia (Irsyam et al. 2017) depict that the area of West Java has a high risk due to the seismic activities related to active faults in the region, i.e., the Cimandiri and Lembang faults with a slip rate of 4 mm/year and 1.5 mm/year, respectively. However, based on a recent study (Meilano et al. 2012), the slip rate of Lembang fault is 6 mm/year with a locking at depths of 3–15 km. Our results indicate that there are at least four events along the Lembang fault from 2009 to 2015. One of them caused some damages in the area of the 28 August 2011 (ML 3.3) earthquake, which was located in western part of the fault. Our focal mechanism solution is in good agreement with a previous study result (Afnimar and Rasmid 2015), in which the source mechanism along the Lembang fault depicts a left-lateral slip. However, in the eastern part of the fault there was an event with a type of oblique–normal fault. Along the Cimandiri fault, there were at least ten earthquakes from 2009 to 2015 (event number 5–14 in Fig. 6a). The existence of these events gives a possibility that the fault is active. Based on the previous study by (Dardji et al. 1994), the fault type is left lateral, but (Marliyani et al. 2016) and (Hall et al. 2007) suggest that the Cimandiri fault is a reverse fault. The average horizontal displacement of this fault is 0.5–1.7 cm/year (Abidin et al. 2009). Our focal mechanism solutions around the Cimandiri fault indicate a left-lateral slip with an oblique dominant thrust fault in the south. The Baribis fault is a thrust fault that extends from Subang to Majalengka in West Java (van Bemmelen 1949). The average horizontal displacement of this fault is 1.0–2.1 cm/year (Abidin et al. 2009). Along the Baribis fault zone, we have found eight events in the time period from 2009 to 2015, i.e., event number 24–31. The focal mechanism solutions in the western part of this fault zone indicate a thrust fault, while to the east the fault is oblique thrust. We have also found an earthquake cluster in the Bogor area, i.e., in the southern part of Mt. Salak area. The destructive earthquake of 8 September 2012 (ML 4.6) was located in this area, in which the focal mechanism solution shows a thrust fault (event number 32 in Fig. 6a). We interpret that this earthquake is due to tectonic activity, i.e., related to an active fault, which is evidenced by fairly clear waveforms recorded by almost all BMKG seismographs in West Java that show tectonic earthquake types. In the Garut district, interestingly there is a cluster of earthquakes forming a lineament trending in the southwest–northeast direction. Most of the focal mechanism solutions in this cluster indicate a right-lateral fault if lineament originated from a fault activity. We interpret that the events in the Garut district are related to the earthquake event of 2 September 2009 (Mw 7.3) to the south of West Java (Fig. 6). This event was located in the subduction zone between the Indo-Australian and Eurasian plates with a focal depth of 30 km (based on BMKG data). This event is one of the destructive earthquakes that caused hundreds of fatalities. On 6 April 2016, an Mw 5.9 earthquake occurred close to the 2009 event, but the hypocenter is deeper, i.e., at 65 km depth (BMKG data). Many people throughout West Java could feel the shaking produced by this earthquake. 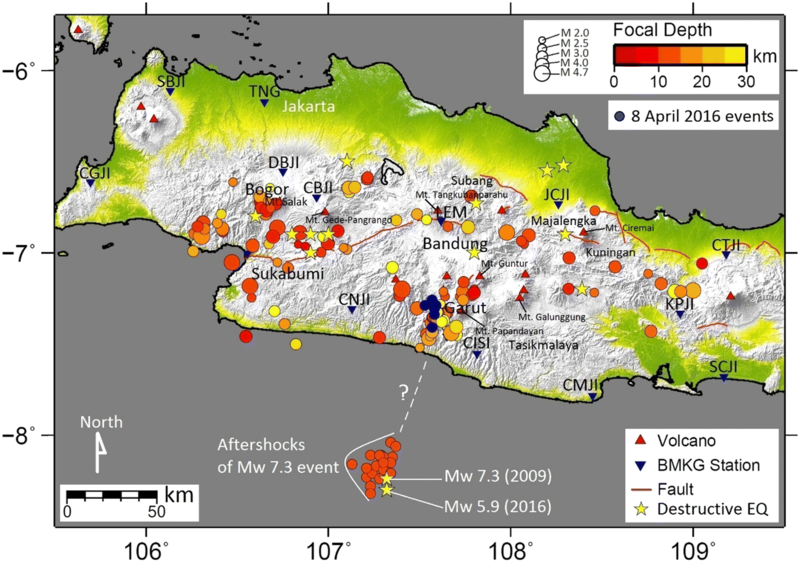 Two days after this event, i.e., on 8 April 2016, six events occurred within the Garut cluster (the blue dots in Fig. 5) with magnitude less than ML 3.0. With these events, we are convinced that there is a relation between seismicity to the south of West Java and the seismicity in the mainland of West Java, especially in the Garut cluster. As suggested by Shelly et al. (2011), seismic waves could initially trigger a fault creep, which may in turn trigger tremors. Statically triggered seismicity is restricted to regions in the immediate vicinity of an earthquake rupture. Moreover, some observations suggest that dynamically triggered earthquakes and tremors are most likely to occur in regions where seismic waves have previously triggered seismicity (Gonzalez-Huizar et al. 2012). In Garut area there are also several active volcanoes, i.e., Mt. Papandayan and Mt. Guntur. The seismicity in the South of Java could trigger tremors around the volcanoes, but we interpret that the relocated events in this study are related to tectonic activity, because waveforms were clearly recorded by the BMKG seismic station network located far from Garut. Our observations in Garut are in good agreement with inferences from these previous studies (Irsyam et al. 2017). The earthquakes due to volcanic activities (volcanic earthquakes) are very local, so it can only be recorded by seismographs located close to the volcanoes. We have successfully relocated 168 shallow earthquakes in the mainland of West Java in the period from 2009 to 2015 by re-examining seismograms. There are 117 events that have been relocated successfully by applying the double-difference method. The seismicity pattern shows clearly several clusters of events located near active faults in West Java, i.e., Lembang, Cimandiri, and Baribis faults. The focal mechanism around the Lembang fault indicates a left-lateral strike slip in agreement with previous studies. Around the Cimandiri fault the focal mechanism also shows a left-lateral strike slip, but it changes to a thrust fault towards the south. While around the Baribis fault zone, a thrust fault is shown, but it becomes oblique to the east. The cluster of earthquakes in Garut forms a lineament pattern trending southwest–northeast, and most of the focal mechanisms in this cluster show a right-lateral strike slip if the lineament is related to local fault. PS, ADN, NTP, SW, DD conceived the study; PS, ADN, SW contributed to the writing of the manuscript. All authors contributed to the preparation of the manuscript. All authors read and approved the final manuscript. We would like to thank to BMKG for the earthquake data used in this study. We also thank M. Ramdhan, H. A. Shiddiqi and M. Anshori for fruitful discussion. We thank for the constructive and helpful comments from the two reviewers. All figures presented were plotted using Generic Mapping Tools (Wessel and Smith 1998). We declare that we have no significant competing financial, professional or personal interests that might have influenced the performance or presentation of the work described in this manuscript. ‘Not applicable’ (PS: earthquake data will be shared through our website after this paper is published). This study was supported in part by the Indonesian Directorate General of Higher Education (DIKTI) research funding 2016–2018 awarded to S.W. and research funding 2017 “Penelitian Unggulan Perguruan Tinggi” awarded to A.D.N.